Feng Huang Dan Zong 、Wu Yi Yan Tea and Anxi Tie Guan Yin are the three big kinds of oolong tea. Feng Huang Tea is produced in Feng Huang county,Feng Huang county has a long history of planting tea,and it has a name of “Country of Chinese Oolong Tea”.the tea gets its name from the name of the county. 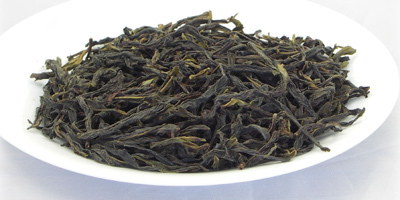 The sale of Feng Huang Dan Zong has a history of 900 years.it was usually exported to Japan、Singapore、Thailand，etc. Feng Huang Dan Zong can be divided into Huang Zhi Xiang、Zhi Lan Xiang、Tao Ren Xiang、Yu Gui Xiang and Tong Tian Xiang,,etc. The picking standarder of Feng Huang Dan Zong is one bud with two leaves or three leaves.The leaves could not be picked when there are strong sunshine、rain or fog.The tea usually be picked in the afternoon and be made during the night. The form of the tea is strong and straight,the color is snuff color with vermilion spots,the smell likes special natural orchis. the bottom of the leaf has red lace,the soup is bright and yellow, the taste is good and sweet. The main processes of making Feng Huang Dan Zong include: solarization、air-green、bump-green、reduce-green、kneading and baking,etc.It takes about ten hours to finish. Feng Huang Dan Zong has many functions,such as enhance spirits,stop thirsty,get rid of greasy,reduce fatness,etc.